Here in balmy Minnesota we are heading into our 4th day off school. Not because of snow but, wait for it…because it’s too cold. We’re talking -35F degree temperatures and -50F degree wind chills. Besides being off our regular school/work obligations and snuggling in with my kids for a few days, there’s nothing fun about this kind of weather. It really makes you think about whether you really need to run to the grocery store, or if that could just wait until, say, summer? Craving something to lift some of this cabin fever we’re feeling, I started rummaging and realized I had all the ingredients for one of my favorite dishes ever, cauliflower ceviche. What are the chances?!? I didn’t even have to contemplate that grocery store run for this one. Score! 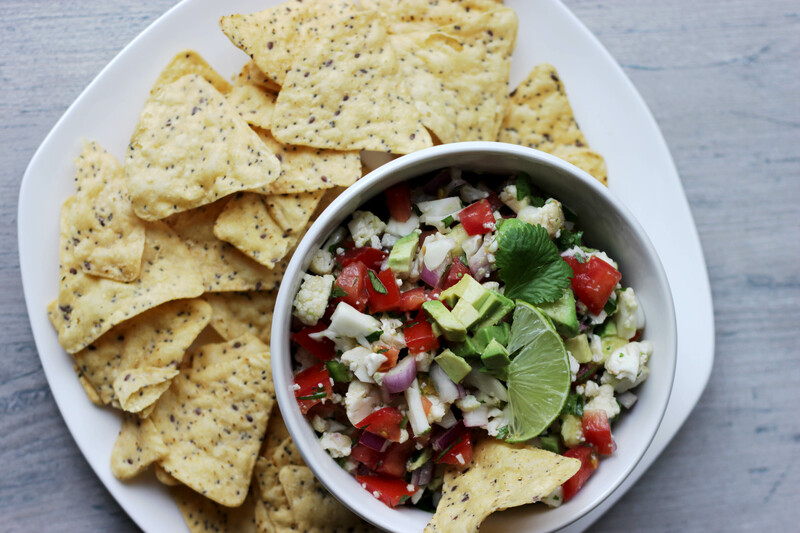 Ceviche is a dish from warmer climates, and one bite will whisk you out of your frozen tundra and onto a tropical island with birds singing and ukuleles strumming peaceful tunes. At least for a moment. But any tropical island is better than none, even if it’s a daydream. Right? Alright, I’ll admit that I don’t actually have anything to compare this cauliflower ceviche to since I’ve never eaten the “real deal.” But, I do know it’s delicious. And once I brought it to a party and someone asked: who brought the ceviche? When I said it was me, they asked incredulously: There’s really no seafood in this?! So, that’s my story and how I know it can definitely hold it’s own at any appetizer table. Or Superbowl table. By the way…did you know Superbowl is this weekend? Of course you did. I didn’t, until a few days ago. Oops. Not big football fans over here. But we are big food fans. So, double-score on this frozen day: a healthy Superbowl snack for everyone to make this weekend. 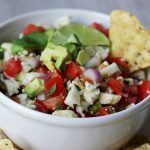 While there are many different ways to make ceviche, traditional ceviche is from Latin America and typically contains raw fish or shrimp marinated in citrus juices. The seafood is then then mixed with onions, chiles, cilantro and tomato and sometimes avocado. Here’s the deal, even though my friend was not fully convinced there wasn’t fish or shrimp in this cauliflower ceviche, it doesn’t taste like seafood. The cauliflower lends the texture of shrimp to this dish and can fool an unknowing person’s brain into thinking it’s seafood. Most of the rest of the ingredients: tomato, lime juice, cilantro, and onion are classic ceviche ingredients, again fooling the unsuspecting taste buds. But, no seafood taste here. Just deliciousness. Since we all know that I love cilantro and am not so keen on super spicy foods, I tend to amp up the cilantro and tone down the spice in this recipe. The recipe below is a happy medium. Feel free to play with the amounts of everything to suit your tastebuds. 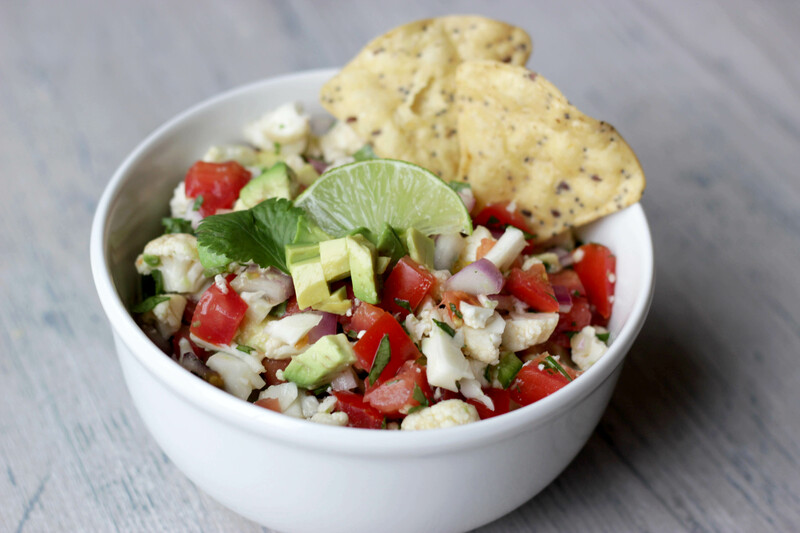 I typically serve this cauliflower ceviche with tortilla chips, but it can certainly hold it’s own and be eaten directly from the serving bowl with a fork. Ahem, not that I would ever do that, but you know…I’m just saying that would work. I hope everyone out there is is warmer than we are here in Minnesota. ENJOY!! 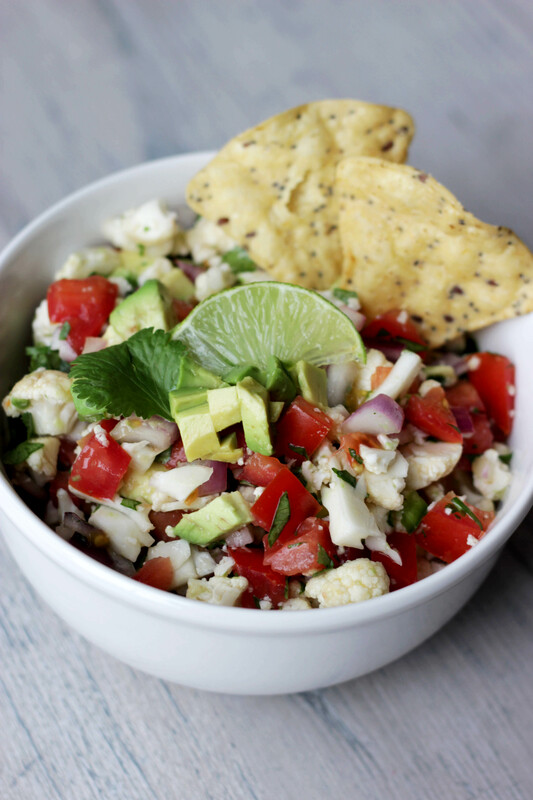 Cauliflower Ceviche makes a great appetizer with tortilla chips or as a side dish at your next meal. Combine all ingredients except avocado and cilantro in a large bowl. Mix thoroughly to coat with lime juice. Add the avocado and cilantro and toss gently, taking care not to mash the avocado. Cover and chill for at least one hour and up to 12 hours. Serve with tortilla chips as a side dish with tacos, or on top of a green salad. ENJOY!